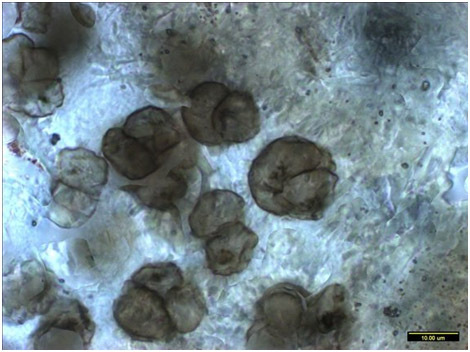 Image source: “These clusters of cells are 1 billion years old, the oldest to appear in freshwater/land ecosysems Credit: Oxford University/Martin Brasier ” This blog entry is about how we got to here from there. This is the promised third blog entry in a three-part series concerned with transposable DNA entries (TEs). The Part 1 entry focused on basics of what TEs are, and why they are important for us concerned with health and aging. The Part 2 entry, The Self-copy Machines in Your Genes, was mainly generated by Jim Watson and provides the “meat and potatoes” of technical content. Twenty one key aspects of TEs are discussed there. This entry is Part 3 of that series. It outlines the key role of TEs in making evolution possible in response to stresses in a changing environment. And it lays out how TEs fit into an emerging unified theory of how evolution works. It tells important parts of the genomic story about how we evolved through becoming higher primates and eventually humans. This entry also includes an introductory discussion of highly-associated basic mechanisms of evolution. These include in addition toTEs: long non-coding RNAs (incRNAs), A to I RNA editing, alternative DNA splicing, and exonization. These fit together and go a long way towards explaining what kicks evolution off on the genomic level and then how it proceeds to happen. These mechanisms are not that familiar to many longevity or biomedical researchers. However, they have a lot to do with normal biological functioning, driving aging, and a multiplicity of disease processes. As a matter of fact, their importance may be paramount. So, Jim Watson and I are working on additional blog entries related to them. Here is some of what I think in a nutshell. Later I will cite research backing these statements up. The human genome – archive of our life history The human genome not only encodes in our DNA what we are now and how we function and can reproduce, but also a complete history of how we got here from the start of life on earth, including all tried and abandoned biological adaptations. This history is encoded in our various RNA sequences, especially in our long non-coding RNA sequences (incRNAs), in our other RNA species (such as circular RNAs), in our TEs, in fossil viruses, and of course in our genes and pseudogenes. Remarkably this immense archive of life history is in every cell of every individual. And similar genomic archives exist in every cell of every other living organism leading up to their current status. These archives of life are essential components of the incredible machinery we have for evolution, allowing us to innovate on a genomic level when there is a challenge, perhaps need for survival, or perhaps just an opportunity to do better. They embody repurposable coding for an enormous number of biological adaptions that have been tried at one point or the other and proven useful, and also for one-time threats such as fossil viruses. The genome documents challenges we have confronted, solutions we have tried and a very large number of solutions and solution components that have hitherto proved useful. And it contains repurposable code for everything tried. Note that this is what I think, hypothesize based on numerous clues, and is not fully supported yet by hard research. What is known is that the human genome archive is more than 50% fossil DNA including some known to be ancient and exist in primitive organisms and is incredibly extensive, there being over 98,000 fragments of leftover “fossil viruses” in our genomes (HERVs) alone. Why do I think it makes sense?. Because if God/Nature had given me the job of designing evolution, I would have started very early on building a gigantic database characterizing what worked and what did not work under various circumstances. And I would make sure that everything tried in my evolutionary history is handily repurposable in case it is needed again. Until a few years ago, most of our genome was thought to consist of dark-matter “junk DNA.” Now I believe it is a major historical asset for problem-solving and biological innovation. I do ask my readers to cut me a little slack especially in this “what I think” section, for I know I may be simplifying the situation too much for some of you. For exanple, I know that some or most of our fossil DNA has been damaged or fallen into disrepair after many generations and is no longer functional in its original role. Most human endegenous retroviruses, for example, have lost their original promoter sequences – thank goodness for that. But even so, many exon and intron components of our ancient DNA probably remain reporposable. And I trust biology to keep around chunks of code that it thinks may be useful in the future. Genomic machinery for survival, thrival and evolution. We also have evolved sophisticated genomic machinery for reaching into this archive of life and using it for innovation as well as for normal biological functioning – to serve to enhance the health of a cell, an organ, an individual, for evolution in a population, and even for the evolution of new species. Research cited below establishes that we have identified mechanisms for creating new proteins, for example. We know about some of the key elements of this machinery and talk about them here, including TEs of course, long non-coding RNAs (incRNAs). A to i editing, exonization and alternative splicing. Evolution is driven by stress signaling. Expression of TEs and the genomic machinery for evolution are activated by stresses, particularly stresses that go beyond the constitutive ones normally experienced. When a cell detects stress signaling a possible need for evolution to support survival, a response is “Let’s see what there might be in our archive of life that might be combined with what we are using right now to support our evolving to survive and thrive despite the stress.” Perhaps this could be a chunk of DNA that was once useful when our ancestors were amphibians starting to emerge from the ocean 420 million years ago but that we stopped using 130 million years ago. Perhaps it is a more recent chunk of DNA from an ancestor hominoid from only 25 million years ago. Evolution is based on guided genomic innovation., So evolution on the genomic level is not based on random mutation followed by trial for survival. Rather it is a matter of guided genomic innovation based on an archive of our entire history of evolution and sophisticted machinery for figuring out what is to be tried next, and only then is there trial for survival. Much of the same machinery employed for evolution also serves our health and functioning as individuals. Expression of TEs and alternative splicing for example, are quite universal processes in a many of routine and necessary biological processes such as generating a vast vocabulary of proteins starting with a limited number of protein-encoding genes. When I did Basic Training as a draftee in the US Army eons ago I was taught a basic principle. “Whatever your position and situation is when out in the field, always be improving it.” I think that is also a basic principle of biological systems. I argue here that current genomic research supports these statements, via our growing knowledge of non-coding DNA and RNA species, and of behavior of TEs and genomic processes such as alternative splicing, A to I editing and exonization. This seems to cut across all species that have DNA – that is, across all life as we know it. The Part 1 blog entry discussed how TEs are activated by stresses, an initial step in the processes of genomic evolution. Stresses also activate alternative splicing. Each life form at any time has adopted for survival in the semi-stable environment it exists in at that time. They calibrate their multiple internal homeostasis-seeking systems to function in that semi-stable environment. A thermoacidophile likes it very hot and acid. We can’t stand that. A methanogen likes it anaerobic with lots of methane, like in a sewer. We don’t. What we have in common is that we have DNA, RNA and have evolved according to some common mechanisms described here. Most everything else is different. Yet, because of constant flux, life forms experience a variety of stresses. Many of these will be mild and more or less expected; some are likely to be serious. Some will be wellness or life-threatening. A short draught or having insects eat a few if its leaves may stress a plant; having all of its leaves eaten by foraging deer may seriously threaten that plant; being overrun by a lava flow will kill it. Lifeforms have developed strategies for going on in the presences of change. Two important ones I focus on here are hormesis and evolution. Both of these strategies are triggered by stress. Hormesis is the strategy used for surviving on the individual level, the capability of an organism or a biological subsystem to respond to a stress by mobilizing its defenses so as to actually improve its functionality, providing that the duration/intensity of the stress falls within a certain range. We have discussed hormesis extensively in this blog. In particular see 2012 Multifactorial hormesis, 2013 The Hormesis Bars, 2012 Radiation hormesis, 2012 Mitohormesis, and 2009 Hormesis and age retardation. Evolution is a stress response mediated by transposable element and alternative splicing expression that leads to genomic change as discussed in this blog entry. This may effect individuals, germ lines, populations or species. I do not know exactly how these ranges may overlap each other and I suspect that some stress responses are both hormetic and TE-activating. Impacts of a given stressor may be different in different organs and in different cells. And they will certainly be different in different individuals. And impacts may be determined by multiple variables such as initial redox state of the organism, circadian status, and other complicating factors. Remember the important distinction known to every engineering student but usually glossed over in the biomedical literature (and, I admit, glossed over here too), the difference between strain and stress. The external stimulus creating a challenge is called a strain, be this an insect attack on a plant a toxin ingested by your dog, or a fight with your boss. Back while I was in 8th grade, I heard that evolution was due to a combination of random variation and natural selection for survival – whatever those meant. Later, perhaps early in college years, I learned further that the random variation was due to changes in DNA such as a DNA base pair mutation caused by a random oxidative event such as the passage of a cosmic ray. As time passed, it gradually became clear to me that there had to be lot more involved for evolution to happen. Evolution involves multiple complex and simultaneous adoptions and happens far more rapidly than can be explained by random molecule or gene-at-a-time events. Transposable elements in our genome – millions of different ones — provide a much more powerful framework for originating possibly useful mutations in our DNA, where long sequences can be exported within and across chromosomes. Sometimes a LINE-1 TE may pick up an unrelated segment of DNA and ship it “to who may be concerned.” Some times a gene may be duplicated that confers an evolutionary advantage, one like P53. TEs both provide a massive mechanism for introducing more than random variations, and they raise the question of the extent to which the “random variation” of evolution is really random, after all. TEs can unquestionably mess up DNA, shipping large sequences into places where they seem to have no function other than to create problems. “LINE-1 expression damages host DNA via insertions and endonuclease-dependent DNA double-strand breaks (DSBs) that are highly toxic and mutagenic(ref).” Yet I side with some biologists who have been increasingly seeing TEs as facilitators of evolution. The 2012 article Transposable Elements, Epigenetics, and Genome Evolution summarizes the situation. “Today, we know that TEs constitute more than half of the DNA in many higher eukaryotes. We know, too, that the fingerprints of TEs and transposition are everywhere in their genomes, from the coarsest features of genomic landscapes and how they change through real and evolutionary time to the finest details of gene structure and regulation. My purpose here is to challenge the current, somewhat pejorative, view of TEs as genomic parasites with the mounting evidence that TEs and transposition play a profoundly generative role in genome evolution. I contend that it is precisely the elaboration of epigenetic mechanisms from their prokaryotic origins as suppressors of genetic exchanges that underlies both the genome expansion and the proliferation of TEs characteristic of higher eukaryotes. This is the inverse of the prevailing view that epigenetic mechanisms evolved to control the disruptive potential of TEs. The evidence that TEs shape eukaryotic genomes is by now incontrovertible. My thesis, then, is that TEs and the transposases they encode underlie the evolvability of higher eukaryotes’ massive, messy genomes.” Epigenetic silencing of TEs is one of the topics Jim Watson treated in the Part 2 blog entry of this series. Rapid mobilization of TEs by stresses may be critical for the success of invasive species. 2014 Transposable element islands facilitate adaptation to novel environments in an invasive species. This one is about an ant species. Stress-activated TEs and the other pro-evolutionary mechanisms characterized in this blog entry also play roles in the stress responses of individuals for maintaining homeostasis and in disease processes. These topics are not just about what went on during tens of millions of years of evolution, They are also about what goes on in us right now. 2012 Presidential address. Transposable elements, epigenetics, and genome evolution. 1995 LTR-retrotransposons and MITEs: important players in the evolution of plant genomes. 2013 Abundance and distribution of transposable elements in two Drosophila QTL mapping resources. As pointed out above, the important role that TEs seem to play in evolution is that of selectively enhancing genetic diversity in response to stress. This begs the question of exactly how that genetic diversity can lead to enhanced survivability. What are the evolutionarily conserved mechanisms of “survival of the fittest?” Is genomic evolution purely a matter of trial and error once TEs mix-and-match and spread the DNA around? incRNAs are long non-coding RNAs generally greater than 200 nucleotides in length, an important species in the RNA Zoo known for their regulatory functions and possible association with cellular senescence(ref)(ref). lincRNAs are long intergenic noncoding RNAs(ref). That is, they live in the regions of DNA between genes. Recent research suggests that TE insertions contribute significantly to the DNA found in long non-coding RNAs. This can explain the rapid gene evolution observed in long non-coding RNAs. Up through the mid-late 70s, biologists thought that a single gene could make only one unique protein. Now we know that a single gene can make tens or hundreds of thousands of different proteins, The secret is alternative splicing together of gene components – exons or introns converted to exons – going into the translation phase of protein making. Alternative splicing is not “alternative.” It is the regular way biology operates. Alternative splicing is extremely important, not only for evolution but also for health and longevity. James Watson and I are currently working on blog entries on it which I expect we will publish shortly. Here is an illustration of A to I editing. Exonization can convert an intron in a segment of RNA into an exon, which means that instead of being left out during translation it gets converted into a protein-encoding segment of DNA. If the intron so-converted comes from a TE insertion, an alternative splicing and possible new protein results. The result can frequently be negative. Italics in quoted segments of text are my own, for emphasis of particularly important points. There we have it. Combine TE insertions, exonization and alternative splicing, and it seems we can come up with new genes. The following documents tell important additional parts of the story about how we made it to becoming humans. Another part of the same story is told in the 2013 publication related to TE DNA insertions, long non-coding RNAs, simian and our evolution is ANRIL/CDKN2B-AS shows two-stage clade-specific evolution and becomes conserved after transposon insertions in simians. “BACKGROUND: Many long non-coding RNA (lncRNA) genes identified in mammals have multiple exons and functional domains, allowing them to bind to polycomb proteins, DNA methyltransferases, and specific DNA sequences to regulate genome methylation. Little is known about the origin and evolution of lncRNAs. ANRIL/CDKN2B-AS consists of 19 exons on human chromosome 9p21 and regulates the expression of three cyclin-dependent kinase inhibitors (CDKN2A/ARF/CDKN2B). — RESULTS:ANRIL/CDKN2B-AS originated in placental mammals, obtained additional exons during mammalian evolution but gradually lost them during rodent evolution, and reached 19 exons only in simians. ANRIL lacks splicing signals in mammals. In simians, multiple transposons were inserted and transformed into exons of the ANRIL gene, after which ANRIL became highly conserved. A further survey reveals that multiple transposons exist in many lncRNAs. — CONCLUSIONS:ANRIL shows a two-stage, clade-specific evolutionary process and is fully developed only in simians. The domestication of multiple transposons indicates an impressive pattern of “evolutionary tinkering” and is likely to be important for ANRIL’s structure and function. The evolution of lncRNAs and that of transposons may be highly co-opted in primates. Many lncRNAs may be functional only in simians.” We became smart and capable monkeys, poised later to evolve further into us humans. 2012 Intronic retroelements: Not just “speed bumps” for RNA polymerase II. 2013 Retroelements in human disease. 2005 Gene-breaking: a new paradigm for human retrotransposon-mediated gene evolution. 2011 Intronic L1 retrotransposons and nested genes cause transcriptional interference by inducing intron retention, exonization and cryptic polyadenylation. 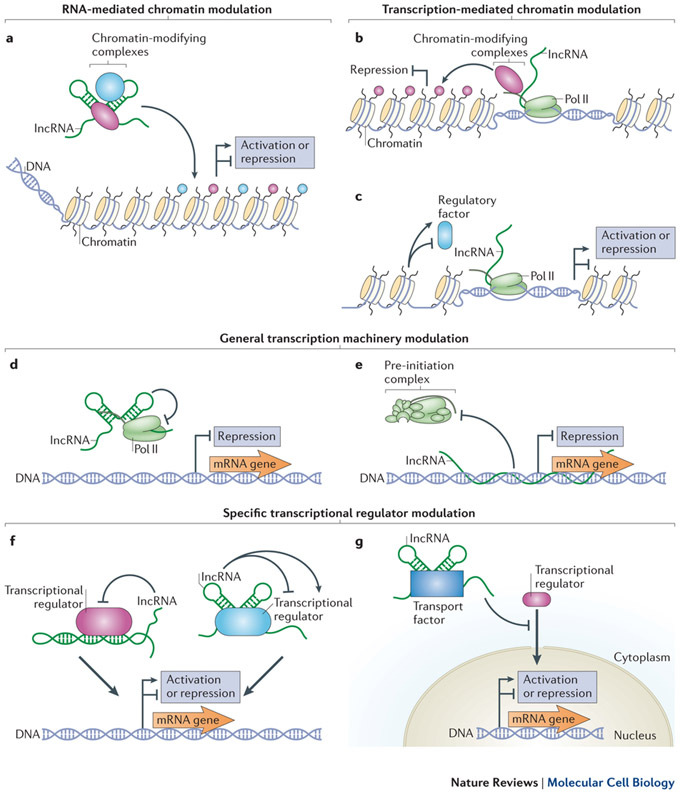 2009 Exon-trapping mediated by the human retrotransposon SVA. 2007 Biased exonization of transposed elements in duplicated genes: A lesson from the TIF-IA gene. 2010 Transposable elements in disease-associated cryptic exons. 2009 Disease-causing mutations improving the branch site and polypyrimidine tract: pseudoexon activation of LINE-2 and antisense Alu lacking the poly(T)-tail. 2006 Identification of multiple transcription initiation, polyadenylation, and splice sites in the Drosophila melanogaster TART family of telomeric retrotransposons. 2004 Activation of cryptic 3′ splice sites within introns of cellular genes following gene entrapment. 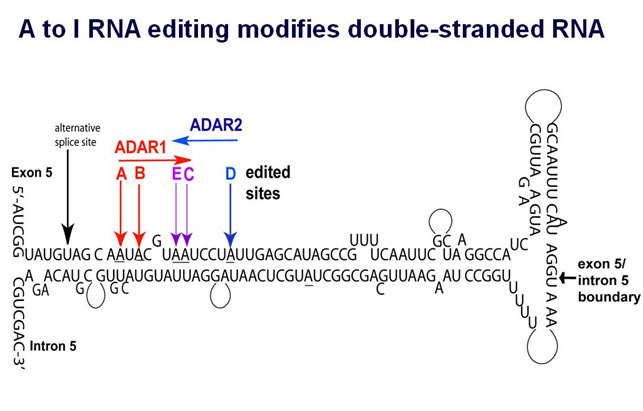 2010 Functions and regulation of RNA editing by ADAR deaminases. 2010 Genomic gems: SINE RNAs regulate mRNA production. 2009 Transcription of the rat testis-specific Rtdpoz-T1 and -T2 retrogenes during embryo development: co-transcription and frequent exonisation of transposable element sequences. In November 2013, I published a blog entry treatise Prospectus for a Grand Unified theory of Biology, Health and Aging. The discussion was focused on the possibility of identifying unifying principles of biology that provide a simple basic structure for this field of incredible complexity. The concept of a GUTb was introduced earlier in my PowerPoint presentation Multifactorial Hormesis which examines the roles of stresses and stress responses in biology. The closest thing to a GUTb we have ever had in biology is Darwin’s theory of evolution, and it is precisely because of the importance of TEs to evolution that I was originally motivated to write this blog entry. To start, I list some properties I would like a theory to have to qualify as a GUT. A Grand Unified Theory of Biology (GUTb) must be concerned with universals. It should apply to all life forms ranging from primitive viruses, molds and bacteria to plants, ants, gnats, mice. lice, whales, snails, dogs, frogs, hogs, monkeys, donkeys and all other animals including us. And methanogens, certainhalophiles and thermoacidophiles and lot of other entities with strange names. That is, it should apply to all entities in the three main categories of life: bacteria, archaea and the eukaryotes, which include animals, plants and fungi. It should apply to all levels of biological organization (e.g. molecular, cell, organ, system, whole organism and organism in social context). It should be interesting, exciting, have predictive power and be consistent with all we know, including about evolution. It should apply historically, for now, and for the foreseeable future. It should provide us with insights into what all life is about and help guide our research. I believe what is said in this blog entry related to TEs, non-coding RNAs, alternative splicing, A to I editing, exonization and evolution stands up to these criteria. In the process of researching these blogs, I believe we are beginning to discern the basic mechanisms of evolution – what kicks it, off, the genomic steps of it happening, and even more fundamental – what it is: how it works in species, in populations and even within individuals. I believe Jim Watson joins me in finding this very exciting. I think a GUT of biology is no more about specific processes in specific organelles, cells or organisms – rules, exceptions, and exceptions to exceptions – than a GUT of physics is about the specific ways specific substances move when subject to specific forces. We can catalog, analyze and describe to our heart’s desire but this will always be about specific organisms living in particular circumstances at particular historical periods – the endpoint examples of evolution, not the process of how it works. Rather the GUT should be about how evolution itself takes place, about how new biological entities, rules and even species can come into being when needed. And about how they can go out of being when no longer needed, about mosaicism, about keeping an accessible record of what happened since the start of it all, about repurposing of solutions, and about the insatiable drive of biological entities not only for survival but also for improvement. I don’t want to come across as saying I know a lot about evolution. I don’t. What I do want to convey is that I experience a lot of excitement about what I am learning discussed here. We expect our readers will discover that these blog entries are not just about what happened 150 and 25 million years ago, and glass jars in musty museums with specimens in them. They are about little-discussed but extremely important mechanisms that affect our health and longevity right now, and that point to new interventions beyond those discussed in the usual medical or longevity literature. We plan to discuss specific health and longevity implications of alternative splicing in the following two blog entries. These new blog entries will be centered on the same biological processes discussed here and in the previous blog entries in this series, alternative splicing, TEs, incRNAs, A to I editing and exonization – but focused on disease processes and human health instead of on evolution. Jim Watson and I think that alternative splicing plays a major role in determining health span and lifespan. We discuss how alternative splicing controls protein diversity, protein localization, protein function, and aging. And we discuss how ubiquitous alternative splicing is, playing key roles in such diverse areas as gender determination and autism, and in several key longevity-related pathways. Alternative splicing is a critical feature of both the IGF-1 gene, the high affinity IGF-2 protein found in cancer, and the IGF-1 receptor (and the insulin receptor). Alternative splicing may explain much of the difference between super centenarians and “regular people” who do not carry longevity-related mutations, It could account for the differences in longevity in those of us who do not have a heterozygous “Loss-of-function” mutation in our IGF-1R gene. The next blog entry in particular, written by Jim Watson, will focus on Hutchinson-Gilford Progeria Syndrome (HGPS), a model of aging where children go through all the steps of aging and die as old men and women from diseases of old age before their 20th birthdays. The key matter involved is hereditary alternative splicing of a single gene, Lamin A.